Buried in yesterday’s New York Times piece about the Wildenstein art dynasty going Chernobyl, with everyone suing everyone. 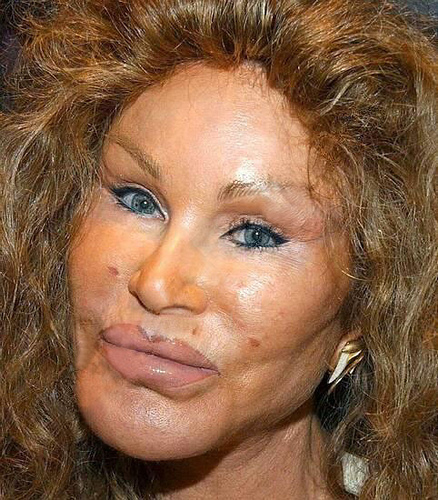 Jocelyn Wildenstein, Alec’s first wife, known for her extensive plastic surgery, more or less opened the internal workings of the dynasty (the business was founded by Daniel’s grandfather). Her revelations in the 1990s include information about the family’s free-spending lifestyle, which included that 58,000-acre ranch in Kenya, Ol Jogi, described as home to hundreds of elephants and white rhinos. Known for her extensive plastic surgery? Really? C’mon, Timesniks: Jocelyn is the legendary Bride of Wildenstein, known far and wide for her tragic plastic surgery. Ouch. But credit where cosmetic’s due, eh? This entry was posted in Uncategorized and tagged Alex Wildenstein, Bride of Wildenstein, Guy Wildenstein, Jocelyn Wildenstein, New York Times. Bookmark the permalink. Never would’ve happened if the Times had done its job, Bob. Don’t you think?